Kansas guard Quentin Grimes (5) and Kansas guard K.J. Lawson (13) defend against Auburn guard Will Macoy (22) during the first half on Saturday, March 23, 2019 at Vivint Smart Homes Arena in Salt Lake City, Utah. Salt Lake City — For a program like Kansas basketball, the end of the season brings with it questions about the future of the roster, the stay-or-go dilemma for KU’s future pros and the prospects of what the next group — in this case, the 2019-2020 team — might look like in the very near future. 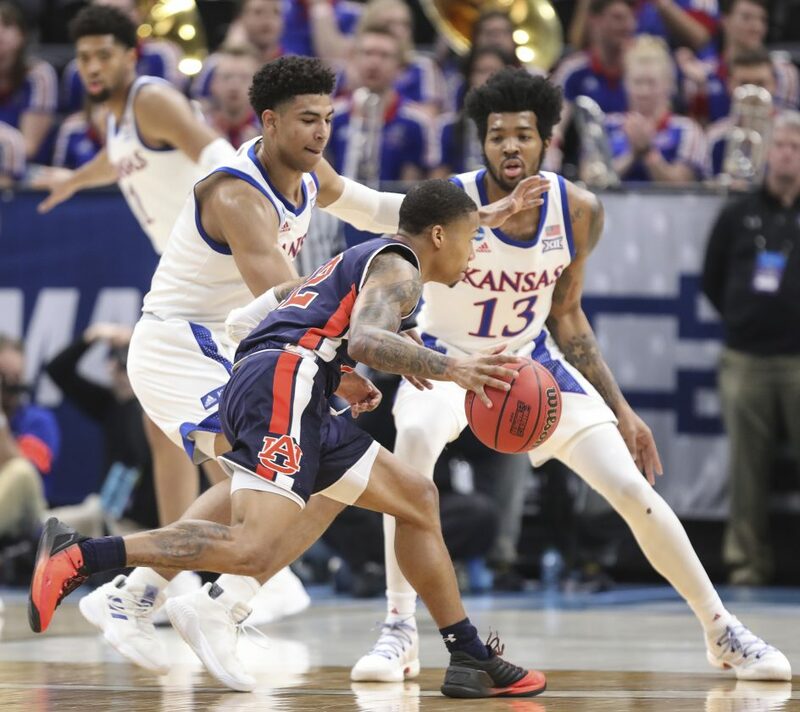 This KU team, which had its season come to a screeching halt with an 89-75 beatdown at the hands of 5th-seeded Auburn on Saturday night at Vivint Smart Home Arena, is not without those questions. 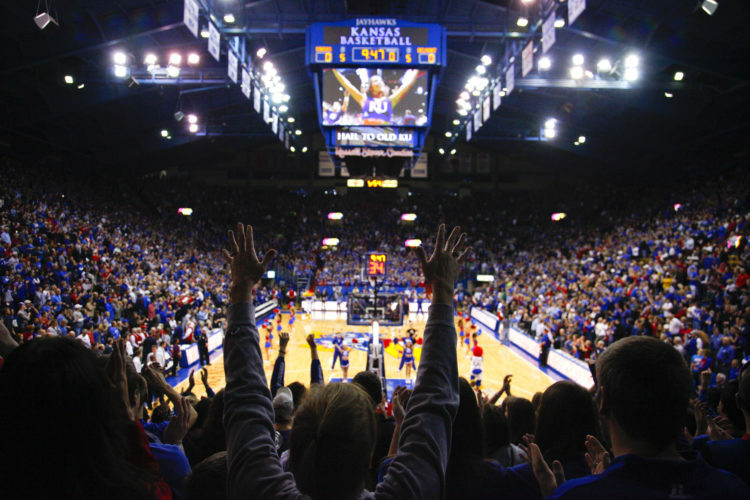 In fact, despite their 26-10 record and the end of the Big 12 title streak, these Jayhawks have just as many questions as any in recent memory and the weeks ahead will be about dealing with those. 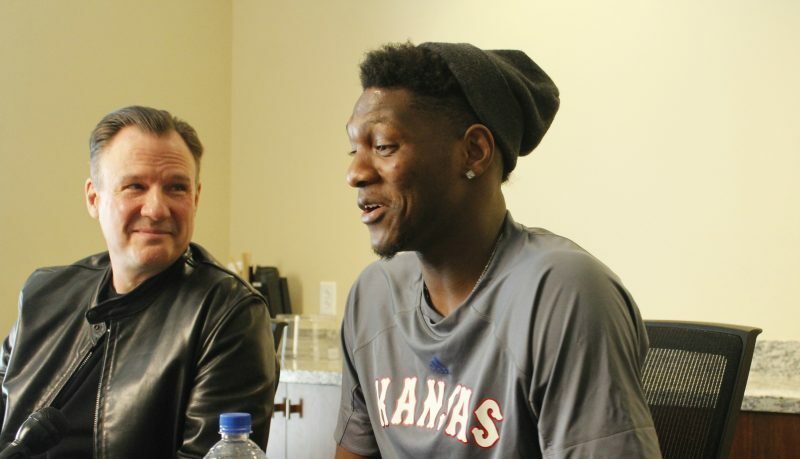 Grimes, who entered KU as a projected lottery pick, endured an up-and-down season with the Jayhawks and fell off of most NBA mock draft sites. But his size, age, skill set and upside still make him an attractive prospect in the eyes of some talent evaluators. And Grimes is far from the only Jayhawk who could have some thinking to do and decisions to make in the coming weeks and months. Like Grimes, Lawson said he was not thinking about any potential decisions on Saturday night. His brother, K.J., who transferred to KU from Memphis with him and will graduate after this semester, also could have a number of options open to him, as well. But he, too, was not in the mindset of worrying about such decisions or discussions on Saturday night. The only thing we know for sure about next year’s roster, as of today, is the fact that Kansas will be without senior Lagerald Vick — who left the team to take a personal leave with 13 games remaining this season — and that the team has signed Class of 2019 guards Christian Braun and Mackey McBride. The Jayhawks remain in pursuit of some of the top talent in the 2019 class — top 10 prospect Matt Hurt chief among them — and, one way or the other, will almost certainly have to sign a few more pieces for the 2019-20 season. Who those pieces will be, what positions they’ll play and how many they will need are all questions that will be sorted out in the next couple of months. But if there was one thing, regarding this topic, that was weighing on Self’s mind Saturday night, it was the disappointment of what the second-round exit means for Dedric Lawson, a player whom Self called “one of the special kids we’ve had in our program in recent years,” after Saturday’s loss.